With Berlin’s IFA 2011 mobile expo fast approaching, Samsung has unveiled four new smartphones that it intends to showcase at the event, each bearing the fruits of the Korean smartphone vendor’s new naming policy. Samsung adds the Galaxy W, Galaxy M Pro, Galaxy Y Pro and Galaxy Y to its Galaxy Series of smartphones, each unique in terms of features and pricing. In a bid to simplify the way it names its smartphones and to reduce consumer confusion, Samsung has begun to categorise the handsets in its Galaxy range into five different categories, sub-categorising each device into as many as three variants. Samsung’s top-end handsets will now be given a “S” (Super Smart) classification and in most cases will be one of the company’s flagship phones. “R” or Royal, is a premium model which combines power, design and productivity, with “W” (Wonder) delivering high-quality strategic models and “M” (Magical) phones coupling performance with a decent price. The “Y” (Young) range of smartphones targets younger demographics or new smartphone owners, priced lower to appeal to emerging markets. Each category of smartphone will have three classifications; Plus, Pro and LTE – indicating an upgrade to an existing model, the addition of a QWERTY keyboard or 4G support respectively. The Samsung Galaxy W smartphone is a candybar handset that is powered by Android 2.3 and features a 1.4GHz processor, 3.7-inch WVGA (800×480) TFT LCD, and 14.4Mbps HSDPA, 5MP camera, Bluetooth 2.1, Wi-Fi 802.11b/g/n and 1500mAh battery. As a Pro model, the Samsung Galaxy M Pro is a QWERTY smartphone that comes with 2.66-inchWVGA (480×320) display, Android 2.3, 1GHz processor, 5MP rear-facing camera, front-facing VGA camera, Bluetooth 3.0, Wi-Fi 802.11b/g/n and 1350mAh battery. 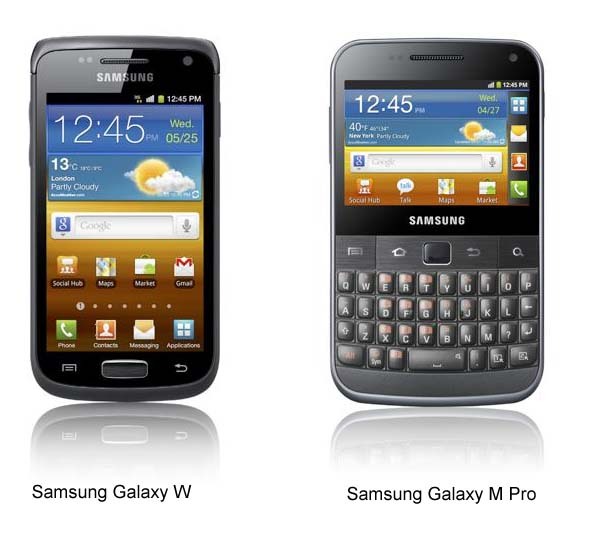 The Galaxy M Pro launched with enterprise app support for Cisco Mobile, Webex and Sybase Afaria. The Galaxy Y is an entry-level smartphone, running Android 2.3 with a 832MHz processor, 3-inch WVGA (320×240) display 2MP camera, Bluetooth 3.0, Wi-Fi 802.11b/g/n, 7.2Mbps HSDPA and 1200mAh battery. 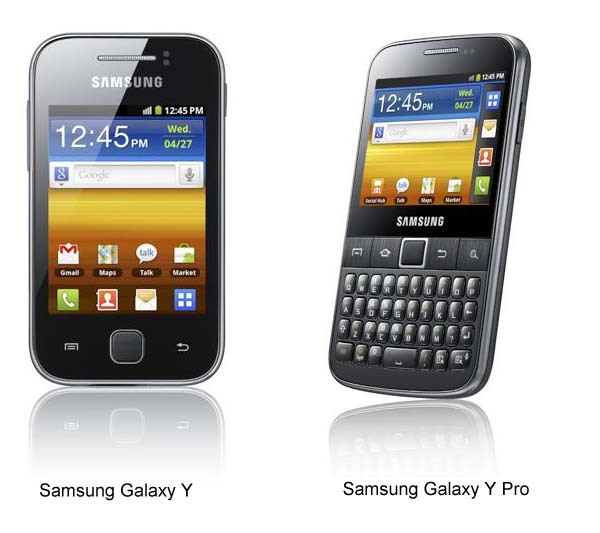 Very similar to the Galaxy Y, the Galaxy Y Pro adds a portrait QWERTY keyboard and sports a 2.6-inch WVGA display, Android 2.3, 2MP camera, Bluetooth 3.0, Wi-Fi 802.11b/g/n, and 7.2Mbps HSDPA. Each of the devices will be showcased at IFA 2011, where Samsung will likely announce newer, more powerful smartphones and tablets.